I have found that learning how to manage your time more effectively is such a struggle. It is an area of my life that has never come naturally to me. I realized as I became a mom and wife and blogger that how I managed my time was important because there is a lot of things to do and life can be overwhelming if you don’t manage it and let it manage you. 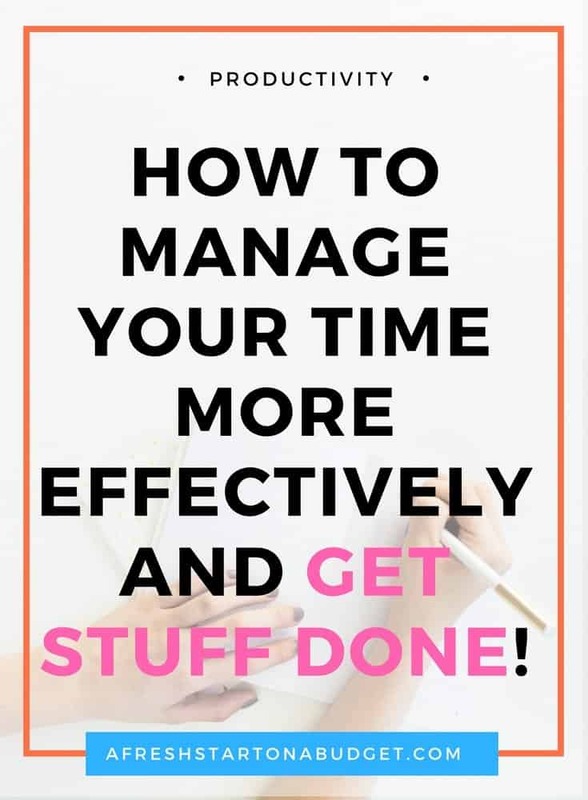 I know that there is a lot of information out there about how to manage your time more effectively. I have read and tried a lot of different techniques and ways to be in better control of my schedule and start accomplishing more. Here are some of the ways that I know work for me and how I use them to take back control of my time better. We are starting with setting goals. If you really want to manage your time more effectively than you need to be clear on what you want to achieve. I have written a lot about setting goals because it is the best thing you can do to start accomplishing more and get things done. I set goals all the time and you can read about my goal setting process here. I started getting serious about setting goals two years ago. I have seen a lot of improvement in both my personal and business life since doing so. I actually get things done and am moving forward towards where I want to go. Oh lists, how I thought they were so ridiculous when I was growing up. My mom is a big fan of lists! I’m still not to here level but I need my daily to-do list to get things done and manage my day. Every morning or the night before if I’m on top of things I create my daily to-do list. I love using Evernote for this and it’s so exciting when I cross everything off the list for the day. Very Motivating! That being said while I love Evernote you may not and finding the right tools to help you manage your time is so important. Don’t be afraid to try a lot of different ways and take the time to figure out what works for you and your life. I personally love Google Calendar, Evernote, and the Pomodoro method. Have you tried task batching yet? Game changer. Why? Because it stops you from having to constantly multi-task. Which doesn’t work no matter how much we want it to. So how batching works is instead of doing tasks and projects as they come up you plan ahead and batch all the like tasks together. You have a day where you do all your photos for the month, a day where you create all your social media images and schedule, a day of writing posts, etc. That way you don’t have to keep switching tasks and losing focus. That way you don’t have to keep switching tasks and losing focus. You also don’t have to keep wasting time setting things up. You get everything ready to take photos once and get them all done. You create the templates you want to use once and do all your social media scheduling. Going from task to task wastes a lot of time and you don’t have that with batching. So you have your daily to-do list ready to go and you are starting your day. You could go for the quick win and get the easy stuff done first which is what people usually do. The problem with this is that you leave the more time consuming or challenging tasks still on your list. Then you either have to push through at the end of the day to get them done or you move them to tomorrow’s list. The better plan is to get the harder or longer tasks done first. A method is known as eating the frog. The book Eat that frog really explains how to master this method of time management really well. I tend to want to put off the things I really should be doing. The important tasks that are harder and take more time and energy. Then I burn out during the day and don’t get them done. Doing things in this way. Getting those big important tasks done and over with also leads to a sense of accomplishment that can help motivate you throughout your day to do more. You got through the hard stuff and it feels great so keep going. I’m a procrastinator and I know this. So I’m really good at finding distractions to keep me from doing what needs to get done. Are you the same way? I know procrastination affects a lot of us. So we need to figure out ways to help us stay focused and not distracted. Check out this post on the #1 way to stay productive. Doing this one thing helps so much to eliminate distractions but it’s not enough. You also need to cut back on time wasters like Facebook, Instagram, Pinterest, etc. Set limits to when you can be on social media and for how long. When it comes to learning to manage your time more effectively there is a lot of different ways to do it and it’s a process of trying new things and finding the methods that work for you and your life. I hope you will take the time to try out these ideas and learn to manage your days better. So many great tips! I really need to start batching my work. I think that will definitely help me out a lot. I also love making lists and goals, so I gotta get back in the habit. Thanks for the great reminder. This is such a powerful post and it was very well written. I agree. Setting goals makes the process much more easy. I love to do lists!!! Definitely helps with focus, time management and seeing progress and completion! I haven’t tried batch tasking but that is an awesome idea!!!! Going to try it out with my blogging tasks!!! I’m so bad about eliminating distractions. I’m a work at home mom…nuff said lol. But, I’ve gotten much better at it, and my husband has been super helpful as well! Thanks for sharing! These tactics are so on point. I really need to work on batching. It’s hard with children that are so young and the spontaneous nature of my day job. great article, i really need to work on getting more organized with my time,instead of running around like chicken with its head cut off!! Batching is really something I need to work on! I’m always one to start with the most important task too – otherwise it could get lost in the shuffle! I love this! Saving it! Especially the tip about eliminating distractions. That is my biggest battle and I love the idea of setting time limits for social media. Thanks!